Jam mode totally on. Round two. I make no promises 'cause I know I can't keep them; I don't swear on my pantry that these jars will be the last of the season, 'cause setting your foot in a farmers' market during summer is like falling in love for the first time (now tell me who's never fallen head over heels for the sweetness of apricots, the color of raspberries, or the aroma of the last strawberries); I don't have the courage to say that's enough, because even if I don't have any room for new shoes, a new jar of jam I always know where to throw it. 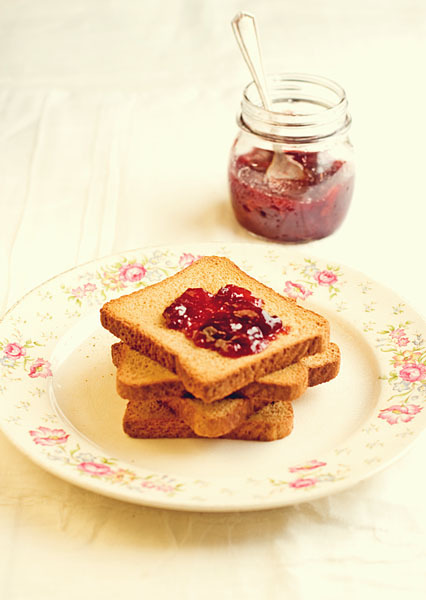 I love jam and I surrender. You in? Pit cherries an cut them in half if they are big. Place them in a bowl and mix them with the juice of one lemon and half the sugar. Peel and pit peaches and then cut them in small pieces, put them in another bowl and mix them with the juice of the other lemon and the remaining sugar. Cover both bowls with plastic wrap and refrigerate overnight. The next day, place cherries and peaches in two separate pots, adding the peel of one green apple in each. Cook fruit separately, stirring occasionally and skimming if necessary, until each mixture reaches the desired consistency (about 45-60 minutes for peaches, one hour and a half for cherries). In the end discard apple peel, combine the two mixtures and cook for another few minutes. While jam is still hot, pour it in previously sterilized glass jars, close tightly and place them in a pot full of water, boiling for about 20 minutes. Turn off the heat and let the jars cool down in the same water to create the vacuum. Thanks for sharing this recipe! When I write essays for https://hitthegrade.com/, I always need some snacks. I guess this jam with some toasts will be perfect.